Dentist Referrals. Beverly Hills, 90048 Dentist. Z Dental Group, All Digital, Eco Friendly, Green Dentist. 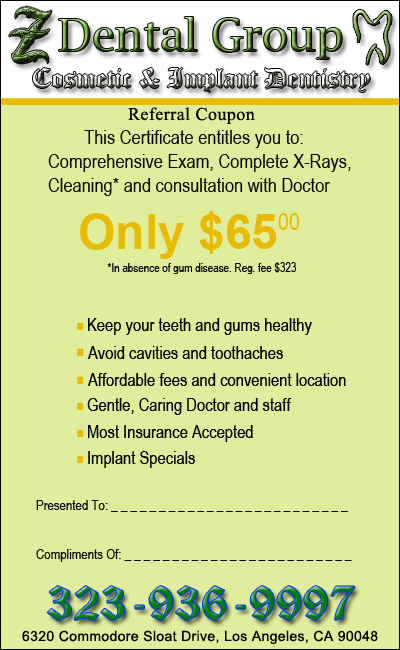 Your referral of a friend or family member to our dental office is one of the finest compliments you can give us. We welcome your friends and family members to become a part of our dental practice. It is also a great gift and a way to show that you care. Please print this coupon and give it to your family member, friend or a coworker. Dont forget to print your name on it, so we know who to thank for your referral.